Now at Tiga Hair Spa not only can you leave with fantastic creations, you can also leave with Advanced Bio-Reconstructed Hair. Prescribed specifically for your personal hair and scalp condition it reverses the signs of damage and brings your hair back to 100% health, shine and vibrancy. 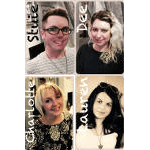 Whether your hair is severely damaged, in need of deep Hydration or Colour Treated we can give you the most advanced salon intensive treatments in 1 single session or a prescriptive course booking for more severe conditions. Hair is (basically) like a tube of Smarties, strong when full but the more that are removed the box can be crushed and broken. Think of the molecules inside the hair like such. The molecules, such as Keratin, Lipids and Amino Acids etc, sit in the cortex and give your hair its strength, shape, texture and colour, if these are removed, such as through chemical processes, heat styling or harsh natural environments then the hair becomes dry, weak and damaged. Split ends occur due to the cuticle becoming damaged. These are microscopic scales that surround the hair shaft like bark and can be opened or closed by the effect of heat or chemical allowing things to enter or leave the cortex. The more time’s this process occurs the more susceptible the cuticle is to becoming damaged, causing “fraying” or “splitting”. The cuticle layer is transparent. When closed and in good condition the scales allow the hair to shine and keep all the molecules within the cortex locked inside. 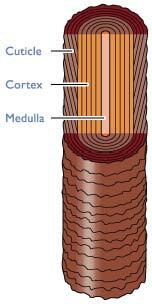 The medulla is only present in the first centimetre of hair and does not contribute to the hair becoming damaged. Fine hair does not have a medulla. The beauty of hair in a cell…. make your hair x4 more beautiful in just one application. Alfaparf have created Cellula Madre Beauty Genesis, the first vial with Argan tree stem cells, capable of unleashing the beauty potential of your hair. By mixing Beauty Genesis with 3 new liquid concentrates the Beauty Mulitpliers, it creates an amaxing gel emulsion that acts on the 3 main hair beauty factors – glow, nourishment and restructuring.